Good Morning everyone. We are well into Fall now and finally the temperatures here agree with the season - this morning it was 57 degrees - yay, sweater weather. I have been waiting for this for a while now. 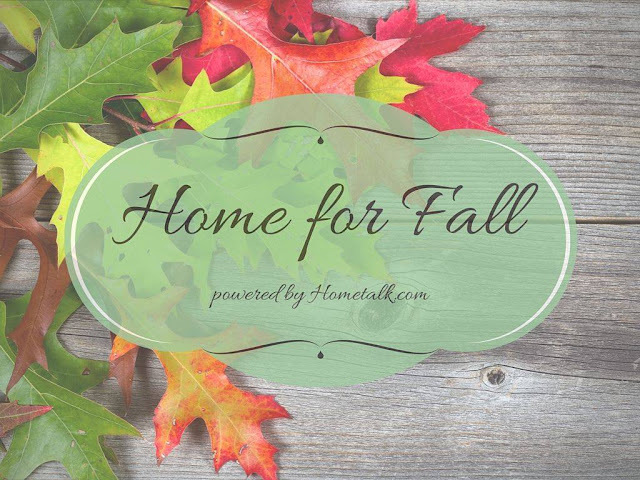 We are celebrating Fall with one big blog hop filled with amazingly wonderful DIY inspiration and creativeness put together just for you. So be sure to visit these wonderful ladies and check out what has been put together for your enjoyment. I am sharing our Fall Entryway today. If you follow me and have seen some of my previous posts on Fall this year you know my theme has been "simplicity". I love simplicity - I honestly think that the saying "less is more" has some merit. So I have kept our entryway quite simple also. 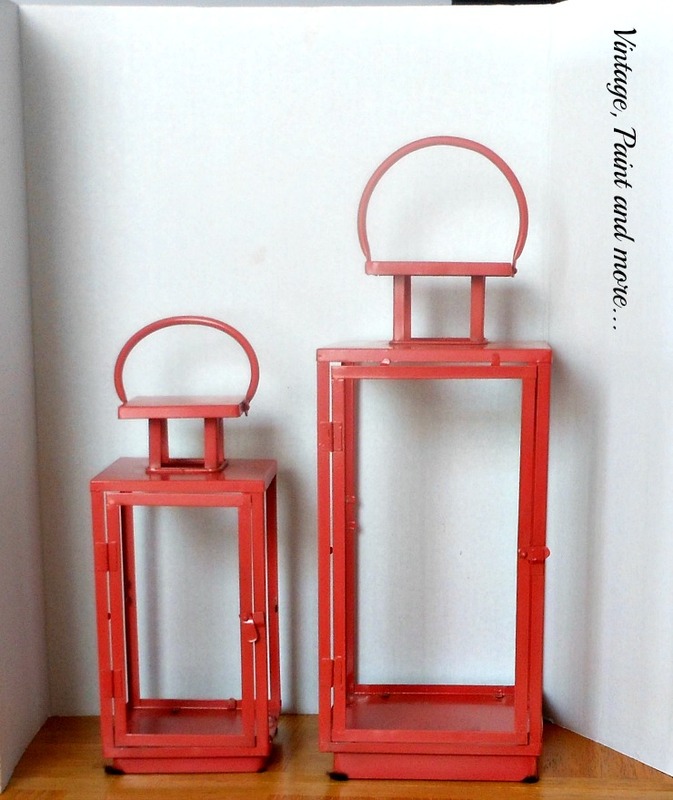 This year's entryway inspiration started with these lanterns I found at the Salvation Army one day. 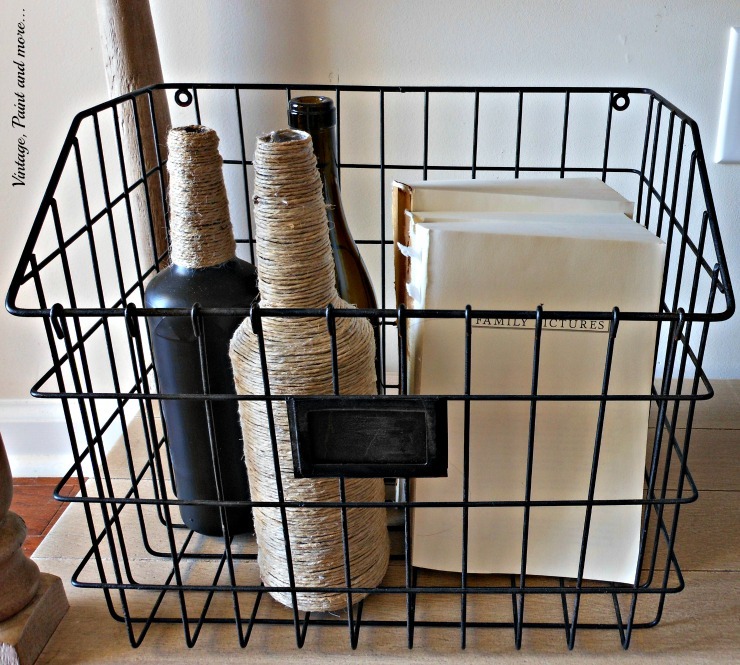 What a difference a little black chalkboard paint can do. I also added a candle with a leaf and some twine to the small one and some "faux" Fall foliage with a twig owl and a blue painted "faux" pumpkin to the large one. I then placed the large one on a stack of books to give it height. I love how they turned out. The other side of our entryway table has a beautiful Fall tray, a grapevine wreath and a white china pumpkin. Simple but brings in all the wonderful colors and textures of Fall. Above the entryway table is a rather large Book Page Wreath that I made a few years back. I love this wreath - it is such a statement piece and also brings a wonderful vintage feel to the space. 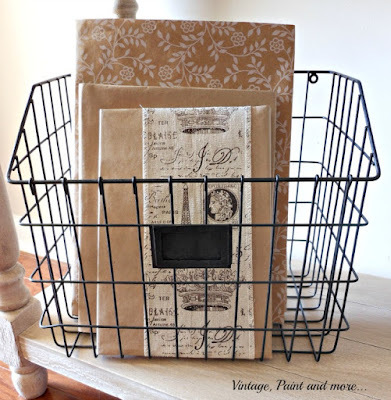 The lower shelf has two wire baskets filled with vintage finds. Old bottles that have been painted and/or wrapped with twine and old books sans covers tied with twine and "faux" foliage fill the first basket. The second basket has several books that I transformed with Paper Book Jackets and a bit of Fall foliage. So that is it for our Fall Entryway this year. I love how simple it was to add color and texture that gives it a very vintage feel without a lot of fuss. Be sure to visit all the great links below - I'm sure you'll find something that will inspire you. Thanks for stopping by and until next time create something you love. Your entryway looks so pretty! 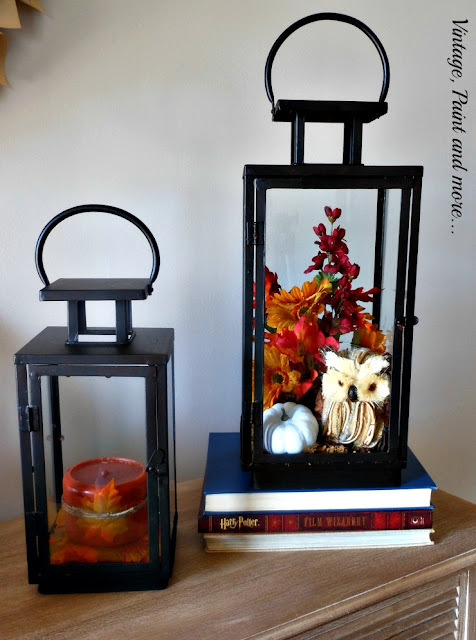 Love the decor in the lantern idea - must do that. Pinning! Thank you so much Angie and thank you for pinning. I love this entry! It is beautiful and welcoming for fall. Thank you Lindsay I'm so happy you like it. Ohhh your black accents are gorgeous! Those baskets stole my heart. Thank you so much Donna. Hi Cathy, I too love simplicity. You styled your entry way perfectly! I love how you gave those lanterns new life! They are so pretty and perfect for fall. And that gorgeous wreath....WOW! Love it! hi cathy! i love your entry! 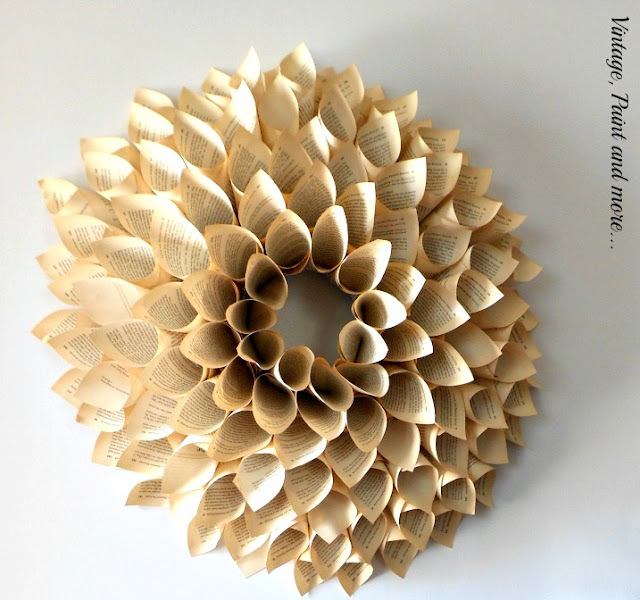 the book wreath is totally beautiful, and i love everything around it too! Cathy, your foyer looks beautiful! Those lanterns were such a great find! I love the makeover you gave them. Thanks for sharing! Your vignette is lovely. Those lanterns were a great find and I love all the crafty details. 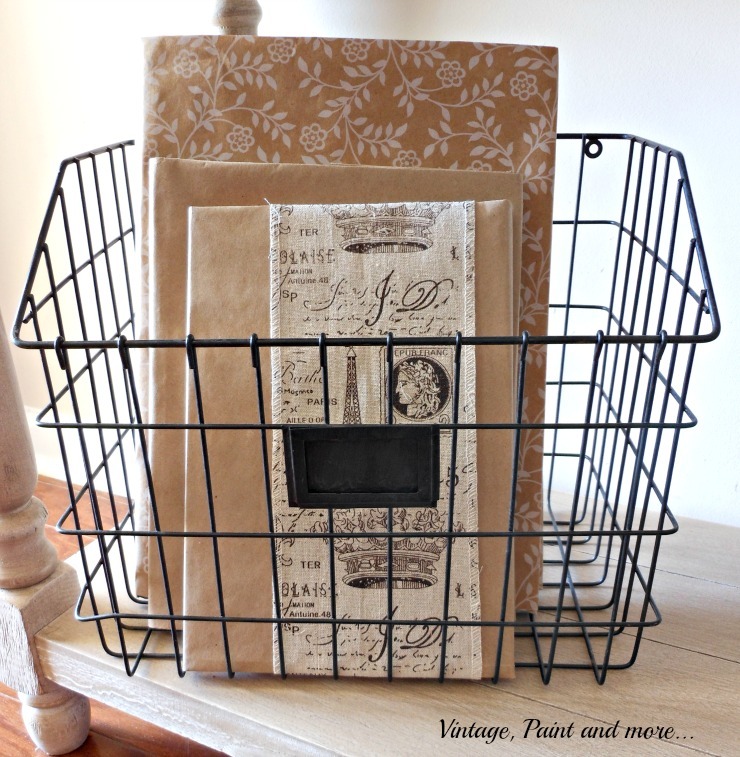 What great ideas for the fall entry Cathy! Thanks for sharing at Cooking and Crafting with J & J. We can't wait to see what you share with us next time! This is really cute. :) So detailed! love, Love LOVE what you created Cathy! I so agree with you that the wreath is a statement piece. It is stunning. I also loved what you did with the thrift store lanterns. What an immprovement. I also love the twine wrapped bottles. So creative and they look fabulous. This is so my style! What a lovely entryway you have. I absolutely adore that paper wreath, very unique. And all the pieces work so well together with the black tying it all together. . Your entry is gorgeous - I love that huge book page wreath! Your entry looks beautiful. I love the wreath and the lanterns looks so much better in black. Lovely. 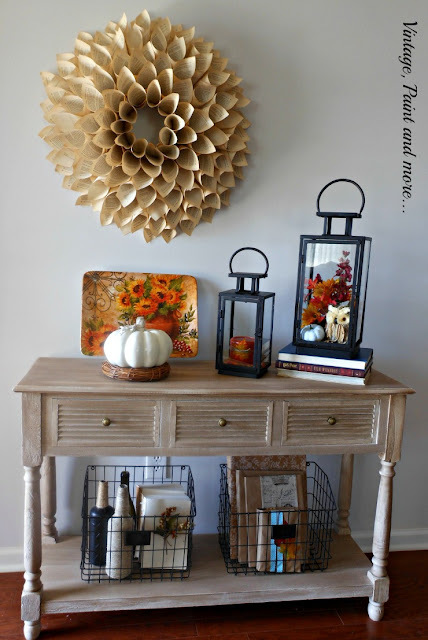 Such a lovely fall entryway! 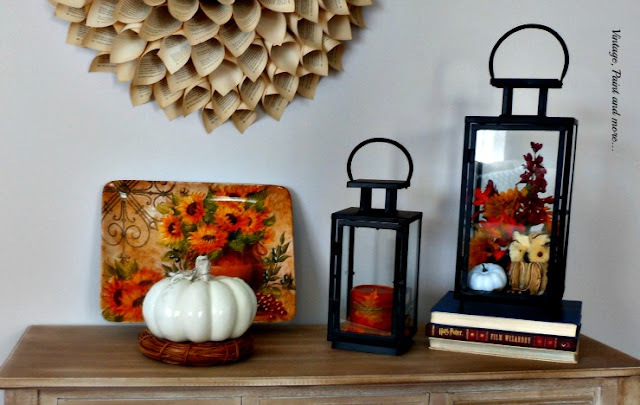 I love the transformation of those lanterns!That book page wreath is stunning. Thank you for sharing and linking up to Friday Favorites! Your entryway looks really nice! Thanks for sharing at Home Sweet Home! Cathy, it really looks beautiful! Although the lanterns look wonderful black, you know that me being the red lover that I am loved them even before. Thanks for sharing with SYC. A beautiful vintage vignette as always Cathy! Thanks for sharing at The Creative Circle.